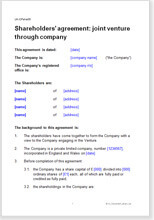 An agreement for a JV, operated through a company formed for that specific purpose. The project that will be undertaken could be anything. Examples are: a property renovation, design and creation of a consumer product, or buying a company in order to sell the assets. Because the company is likely to focus on achieving a single outcome, particular emphasis in placed on exit arrangements, including re-structuring. Note: It is important that the constitution of the company is in terms that permit and support this agreement.